These 15 inch white pads are used with our low speed rotary floor machine for buffing and polishing tiled floors. 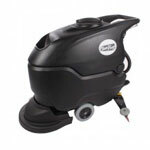 Will provide a medium to high shine, on any smooth floor like; terrazzo, marble, or vinyl tile. Use with our floor buffing compound listed below for best results.